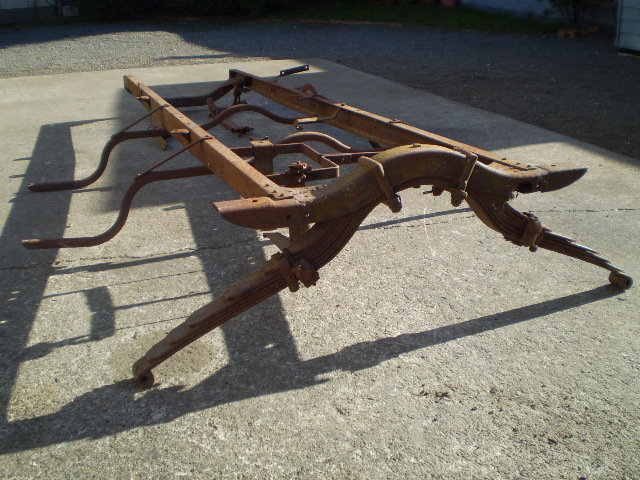 Hi all, photo attached :I have this Frame & need to ID its year, it is RH drive , appears narrower than most & also, what are the spring clamp pads over the leaves for ? please advise, thanks. just to clarify, The pads over the rear leaf spring I question, are two piece steel, matchboxed size & have a felt inner & are secured around the leaves with a spring at each end. 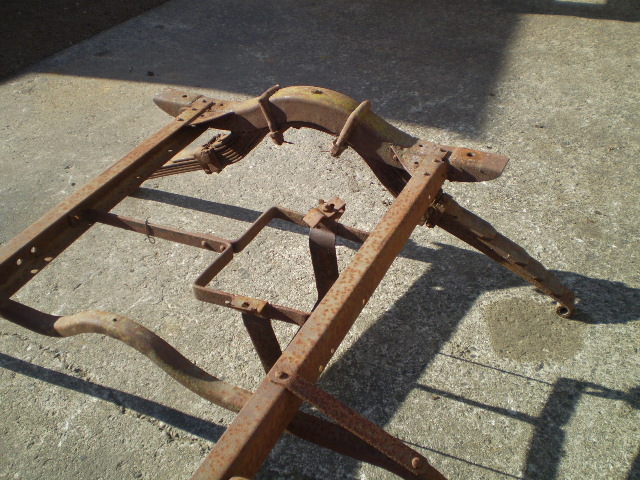 It is a 21 to 25 car frame (pressed steel running board brackets and short rear cross member). I can not see the clamps good enough to say about them, probably some kind of accessory. On LHD cars the hand brake quadrant (four rivets, or two) helps to narrow down the years. Does that apply to RHD? Russ, that frame in Australia would be 1922-1925. Here it would be drilled for LHD fittings as well as RHD. The holes for the steering bracket, handbrake quadrant, starter switch, battery carrier are all drilled in both rails. Most interesting is the battery carrier holes. To allow the fitting of the exhaust pipe, both LHD and RHD cars have the battery on the left of the car. This would seem to indicate that the frame rails were all drilled the same prior to being pressed into their U shape. I believe that's a 21-25 frame. Down here in Texas you would see that type of frame used for a lot farm trailers. They use to be fairly plentiful. Because of the pressed steel running board brackets they made a stronger assembly for using as a farm wagon or trailer. I believe the use of only two rivets used to hold on the brake lever quandrant started in late 25.
have a look at this thread. It has a frame id chart that I put together a couple of years ago. I could post it then but am struggling tonight. hi all, thanks for all the info, I would like to use the frame under a later 26-27 body that I maybe able to get, will that work ?, cheers. I don't know about the availability of T frames in New Zealand, but I would recommend swapping parts to obtain mostly the 1922-25 car or the improved 1926-27 style car parts. The power plant, rear axle, etc swap out fairly easily between 1909 to 1927. But the changes made for the "Improved Car" were primarily dealing with the frame and body. For example the 1925 frame does not have the built in brackets on the front cross member for the 1926-27 style fenders to attach. Note just about any 1909-1925 body will fit any 1909-1925 frame -- the body brackets line up fine (some minor changes needed -- moving the gas tank, use the hood and radiator for the body, etc. note the 1911 torpedo and 1911 open runabout would require many additional changes -- different steering bracket, running board bracket moved etc). And the 1926-27 bodies interchange well with the 1926-27 frames. You can modify any body to fit any frame -- but I believe you will be happier in the long wrong if you have mostly the correct year range parts that fit your car than mixing the 1926-27 body parts with the pre-1926 frame. Note a temporary speedster body etc. could work for you until you find the 1926-27 frame. Also for low budget rebuilding -- in the USA, I believe the 1917-1925 style fenders are easier to obtain than the 1926-27 fenders, the last time I checked. For Gavin -- great chart! Minor suggestion you might want to add a note for based on USA, Canada, UK, NZ etc. Also for the USA cars, the one rivet in each end of the hand brake quadrant started late in 1925. The earlier 1925 cars used the two rivets on each end. Ref: http://www.mtfca.com/discus/messages/411944/445361.html?1400267135 Where it says: During 1925 the brake lever quadrant was modified. Instead of four rivets holding it to the frame, only two were now used. This new quadrant continued until the end of Model T production in 1927.